Hiring an agency has always been more of an art than a science. And, according to the participants of a recent #CMWorld Twitter Chat with Paul Roetzer (@paulroetzer), author of The Marketing Agency Blueprint, it has become even more challenging in the era of content marketing. One of the major problems is that a “gold rush” mentality has evolved around content marketing, so a large number of social media, SEO firms, ad agencies, and others have recast themselves as content marketing firms in order to claim a share of the business. This makes it significantly harder for marketers at medium- to large-sized brands to separate the pros from the posers. During the #CMWorld Twitter Chat, participants offered many helpful suggestions to make the content marketing agency search and qualification process easier and more reliable. Subject matter expertise: Outstanding, high-impact content marketing can’t be created without a thorough understanding of your brand’s industry or marketplace. In other words, subject matter expertise is a must. This has always been an important factor in selecting advertising and public relations agencies. You want a partner who not only understands your industry or market, but has also established relationships with gatekeepers and key thought leaders that you can leverage in your content. In addition, you don’t want to be paying an agency to learn your business — that’s something that should be done on the agency’s own time. Subject matter expertise is even more critical for content marketing initiatives because an agency can’t produce an ongoing stream of top-notch content if it doesn’t understand the challenges your customers face, your competitive situation, and the dynamics of your industry or market. How can you gauge subject matter expertise? Follow the agencies you’re considering on Twitter, LinkedIn, and Google+, for starters. Review their content streams on these channels. Do they demonstrate a depth of knowledge about your industry or market? How do they respond in comments and online discussions? Do their responses demonstrate that the firm is respected by others in the group? Another way to accurately determine the depth of subject matter expertise is to speak with the agency’s clients, if possible. As part of your due diligence, you should ask them questions not only about the work the agency performed on their behalf, but on the real depth of their industry or market knowledge. That they practice what they preach: #CMWorld Twitter Chat participants were universal in agreement on this key point — content marketing agencies should not act like the “shoemaker’s children.” They must have successful content marketing and branding initiatives in place to promote their services and nurture potential clients into sales. How an agency promotes itself is an important early indicator of its competence in content marketing. Look for the consistency of their posts on these channels. If the agency’s presence is sporadic, that’s a potential warning sign that its commitment to content marketing isn’t as ardent as it should be. Look for relevant case histories: If the firm has recently expanded its services to include content marketing, these may be hard to find. Search within LinkedIn Groups, Google+ Communities and other online forums using keywords related to your industry, and look for agencies that contribute their expertise. Search for articles profiling the agency in local newspapers or advertising and marketing publications. Attend local advertising and marketing association functions and ask your peers for their recommendations: Which agencies are they aware of that have experience in your industry or market? Posting this sort of question in an online group is not recommended, however, because the reaction may be akin to throwing meat into a shiver of sharks. Ask to see examples of top-notch strategies they have created for clients: You need to get a close look at how the agency thinks — and how they have translated that into content that has delivered bottom-line results for its clients Don’t be afraid to press agency personnel for specifics on their case histories — especially relevant data that shows just how much of an impact their content marketing initiatives have made. A competent agency should be able to show examples of editorial calendars and personas, demonstrate an understanding of the customer’s buying process, and discuss how they developed content to nurture them along that path. Ask for a list of their clients you can talk to: Relying on a canned presentation of agency capabilities doesn’t give you enough information to make an informed decision, especially when many agencies are claiming to be content marketers, but really aren’t. Talking to an agency’s relevant clients is an important part of any brand’s due diligence. These discussions can give you a more accurate and complete picture of how the agency works — and the results it actually achieved on behalf of its clients. This is a situation where being well connected within your industry or market can pay off. The agency will likely give you a “sanitized” list of clients for which it produced successful results. But if you network among your peers and judiciously ask questions, you may be able to tease out stories where the firm wasn’t as successful and learn a few things about its potential shortcomings. As always, take these stories with a grain of salt. Learn what you can from them, and approach the former client directly, if possible, to get its perspective on what really happened. Above all, when you’re interviewing agencies, don’t rush the process. An excellent agency relationship is a combination of skills and chemistry. Do your due diligence. Ask lots of questions. And leverage your network to learn what others know about the agencies you’re interviewing. Gather objective data about each agency’s clients and track record. For the rest, trust your gut. If the chemistry doesn’t feel right, chances are the agency isn’t a good fit for your brand. Trust but verify: Ask a lot of questions of each agency, but then verify the accuracy of what you hear with its current and former clients, as well as with the “word on the street” from your peers. Capture all of the data you’ve gathered into a mind map so you can view a complete picture of it and identify gaps and areas where you have uncovered conflicting information. This will help you generate follow-up questions you should be asking of agencies and peers who are familiar with their work. Place your key agency selection criteria into a spreadsheet and develop a rating scale that you and your team members agree upon. Include a combination of “hard” (quantifiable data) and “soft” (the agency’s culture and your team’s comfort level with each agency team, for example) measures. Then, after agency presentations and visits, have each stakeholder rank each agency on these criteria. Compare rankings, and use any significant discrepancies you discover as jumping-off points for discussion. Often, one member of your team may have noticed something you didn’t, and vice versa. Talk to former employees of the agency who are in your professional network. They may be able to provide you with an inside perspective on its strengths, weaknesses, and culture. If you don’t know any of its former employees, ask trusted members of your peer network who they know. They may be able to refer you to someone who may be willing to chat informally with you over a cup of coffee or lunch. Pay attention to the agencies and campaigns that are winning awards for outstanding work in your industry, market, or metropolitan area. Attend awards banquets for local chapters of advertising and marketing groups, where you may have an opportunity to view some of the agency’s work firsthand and may get to hear more about the thinking behind their work in a non-pitch setting. Before a brand begins an agency search, it needs to get clear on what it can handle internally and what it should consider outsourcing. #CMIWorld Twitter chat participants were asked to share their tips on how to make this important decision. How can brands find agencies with content marketing expertise? One excellent starting point is this list on the Content Marketing Institute’s website). CMI curated this list for educational purposes, and does not endorse any of the agencies listed in it. Another way to locate agencies is to look for representatives who are sharing their experience and expertise in LinkedIn groups (like the one CMI operates). Once you’ve found someone whose perspective looks interesting, click on the company name in his or her LinkedIn profile. This should take you to the firm’s company page. Finally, look for authoritative articles about content marketing on major websites, like CMI and MarketingProfs. Look for the author’s contact information and Google the name of the firm he or she works for. A content marketing agency can provide a valuable outside perspective. They’re not limited by your organization’s dynamics and internal politics, and can come at your content challenges with an unbiased view, as well as alert you to additional opportunities you may not be seeing. But utilizing an agency to handle part or all of your brand’s content marketing isn’t a slam dunk — nor does it make sense in all situations. The bottom line for brands is to do your homework. Lay out all of the competencies of content marketing in a spreadsheet and assess where your internal staff adds value, and where you need help. Consider the requirements of your strategic content plan, and what that means in terms of skills and competencies. Then develop a clear plan for how and where it makes sense to use an agency. You need to have all of this in place before you start searching for, selecting and interviewing them. Want to take part in the next big conversation on content marketing opportunities and challenges? 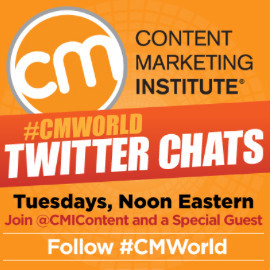 Join CMI for #CMWorld Twitter chats every Tuesday at 12 p.m. Eastern.